Adult literacy was started recently in Guptapada, Odhisha and there has been high commitment from students, teachers and the co-ordinator. This dedication comes even though classes occur for an hour at the end of hard work days. All of the students are women, most of whom are day labourers or work on their family farms. Their days also usually include cooking, laundry, caring for children and other household chores. Despite this, their wish to learn to read on their own is strong. 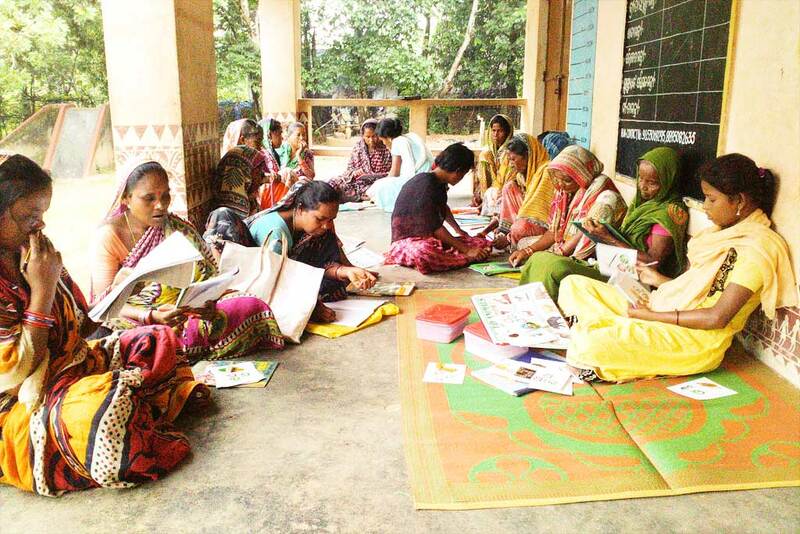 In the beginning of literacy classes for the village women, there were 38 students enrolled, but these days the average daily attendance is 25. Our coordinator in the village makes it a point to visit the homes of regular absentees and motivate them to come, and he often receives a positive response. Currently, the class is split into three groups—low, medium, high—based on grasping capacity of students. This allows for small-group teaching, which is more effective than that for large groups. In addition, each level has one teacher assigned, so they get full attention. The lowest group is still struggling with basic letters, while the medium group has mastered more than half the letter-chart. The high group has moved on to maatras (vowel combinations) and simple words. The main curriculum of classes for the three month period is reading, writing and numbers. In addition to that, every other day, ten minutes are spent on educating the women about health and hygiene awareness. The benefit of this is that the women also take the time to teach their children the proper ways to maintain their own cleanliness. Guptapada is a small semi-tribal village located five kilometres from the nearby main road and is, in fact, legally a hamlet and not a revenue village.